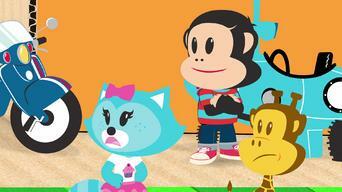 How to watch Julius Jr.: Season 2 (2013) on Netflix USA! 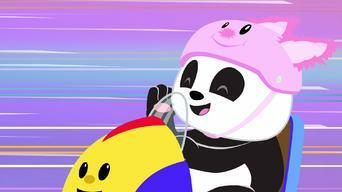 Yes, Julius Jr.: Season 2 is now available on American Netflix. It arrived for online streaming on October 3, 2017. 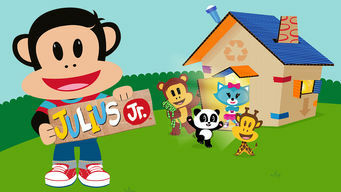 We'll keep checking Netflix USA for Julius Jr.: Season 2, and this page will be updated with any changes. 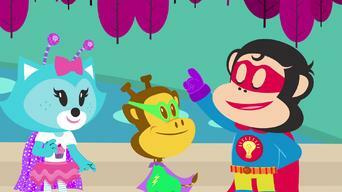 Paul Frank's fun artwork comes to life in this show that follows monkey Julius Jr. and his friends as they explore the world and help each other out. 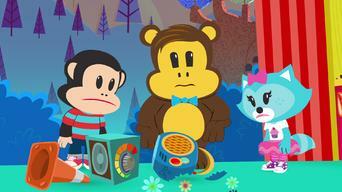 A clever little monkey and his pals transform a cardboard box into an amazing playhouse. All it takes is imagination! 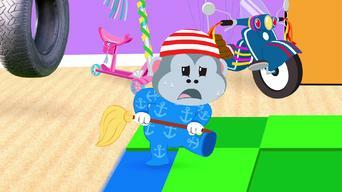 Season 1 of Julius Jr. has 26 episodes. Because different Netflix countries have different availability for episodes, you'll need to check the episode listing below to see which are available in the USA. 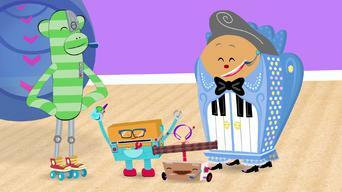 A millipede who longs to fly shows the gang how to like themselves just the way they are; Julius builds a robot to replace Worry Bear's lost toy. Worry Bear gets scared when Clancy's hobbyhorse comes to life; A magic cupcake helps Clancy feel better about being short, but it works too well. Sheree thinks she can run Sagebrush Farm alone until she tries it; the gang learns that Ping's invisible dragon friend is real and needs their help. 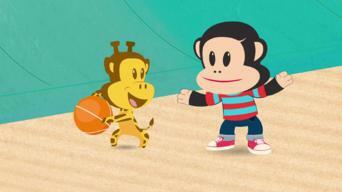 Julius and his friends disagree about what game to play; Julius is afraid to tell Sheree that he doesn't like her banana desserts. Clancy gets sick and the gang goes to extremes to help him fall asleep; Julius is upset when his shadow turns out to be a better inventor than he is. 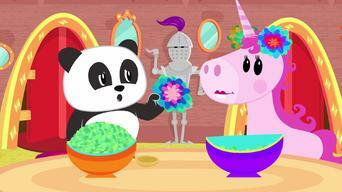 Worry Bear and Ping cooperate on figuring out their Halloween costumes; Ping decides to color the whole box pink, without talking to the gang first. Worry Bear pays so much attention to his sticker collection that he ignores his friends; Clancy gets upset when he can't learn a new sport right away. 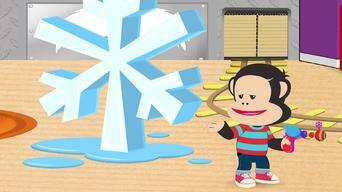 Sheree and Julius accidentally hurt a cloud's feelings while teaching it to snow; The gang tries to teach Worry Bear the fun of trying new things. Sheree's friends "borrow" all her Bouncy Beans without asking permission; Julius gets so caught up in being a hero that he forgets to keep a promise. A shooting star enchants the gang when she crashes into the box; Clancy and Bob the dog get carried away pulling pranks on the gang. 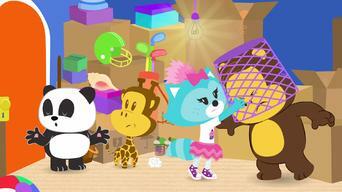 Sheree frets over her birthday gift for Worry Bear; Ping sets out to prove to the friends that she can do things for herself. Dez disappears when it's time to perform a dance with Ping; Worry Bear grows extremely upset when his party doesn't go exactly as he'd planned. Clancy learns the importance of putting things away where they belong; Clancy is afraid to tell Julius that he accidentally broke the Rock Sock 3000. Clancy wants revenge when Sharky the pirate accidentally wrecks the gang's sand castle; a dinosaur dentist helps reassure a scared Worry Bear. The gang's lunch disappears during a picnic in Bugswana; Julius tries to push his ideas over everyone else's in a snowflake-making contest. Julius is so focused on fixing his invention, the Fruitronic 5000, that he forgets to eat; Ping begins to doubt her kite-flying abilities. Clancy and his friends help Pirate Diamondbeard find buried treasure; Worry Bear nearly misses a dance because he's too busy helping others. Sheree tries to find out why there are no pictures of Ping in the gang's photo album; Nova doesn't invite Clancy to her outer-space birthday party. The gang's routine is thrown off when Shaka Brah moves into the box; Julius finds Squeakers the duck, one of his old baby toys. 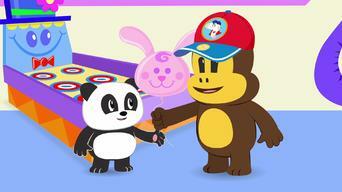 Julius helps Worry Bear find his missing Giggle Goggles; Julius may lose the scavenger hunt when slow Vic the snail joins his team. Clancy turns everything the gang does into a contest, taking the fun out of it all; Julius ignores safety during the launch of his hot-air balloon. 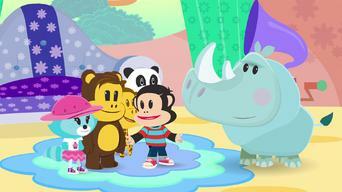 Sheree and the friends find fun activities to do in the rain; Clancy gets careless when Worry Bear asks him to keep an eye on his rock collection. 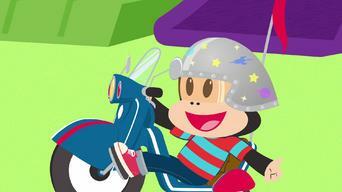 Julius learns that faster doesn't mean better when he repairs Scooter the stunt plane; the gang makes a big mistake when planning a parade. When the gang goes camping on Mars, a spooky story makes Clancy nervous; Worry Bear grows annoyed with Ping, who's trying to be just like him. Julius's music group breaks up, but he finds that his one-man band isn't as much fun; Clancy is frustrated when he can't beat a game's high score. Julius and Clancy try to find a new home for Chachi, who can't live in the cold of Icelaska; Chachi gets tired when everyone plays with him at once. 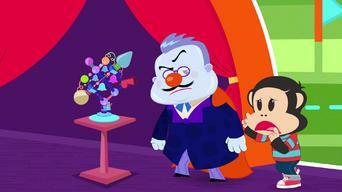 Season 2 of Julius Jr. has 26 episodes. Because different Netflix countries have different availability for episodes, you'll need to check the episode listing below to see which are available in the USA. When Sheree and Ping join Dazzle's club, Dazzle wants to leave Ping out; Everyone wants to know what's inside a box addressed to Pirate Diamondbeard. When Julius meets his idol, The Great Inventini, things do not go as planned; Clancy annoys the gang when they go to a movie that he has already seen. Julius means well when he invents a special robot to take over Nadia's work; Sheree needs to stay positive when Dez spills her shmooshberry jam. Worry Bear claims he has a rare allergy to avoid riding a rubber-ducky-themed water slide; Ping daydreams instead of listening to instructions. The kids are invited to play a pirate game, but Sharky does not play fair; Clancy must work with Worry Bear when they get stuck together with gum. When Sharky is sick with the Shiver Me Timbers, he wants to play with his friends instead of resting; Clancy gets Ping to do his chore for him. The gang tries to celebrate Snowflake Day a certain way, but their version turns out different; Worry Bear gets motion sick playing Starball in space. Julius refuses help from Ping and Clancy, then realizes he spoke too soon; when Clancy is invited to Shaka Brah's for a sleepover, he gets homesick. Sheree has a hard time deciding which friend to invite on Nadia's new Skymarine; Sharky needs his friends' help to conquer his fear of the dark. The friends try to stay awake through the night to witness the once-a-year blooming of a special flower; Shaka Brah's shy cousin visits the box fort. Julius tries to create the ultimate back scratcher; Ping is thrilled when she invents something with Julius, until her friends put in their two cents. 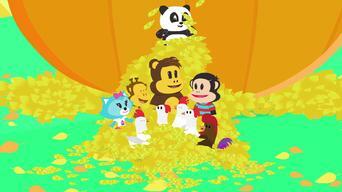 Julius invents something to brighten Worry Bear's rainy day; Julius wants all of his friends to celebrate together, so he invents a new holiday. 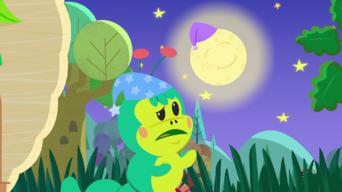 Ping gets frustrated when she is constantly cast as the baby in a game of dress-up; Ping feels upset when it seems that Julius is allergic to Chachi. Worry Bear needs help when he loses his lucky hat before going onstage and forgets all his jokes; Julius struggles to learn a popular new dance. Rock Sock feels ignored by Julius and goes to work for Nadia; Clancy realizes he's the only one among his friends who doesn't have a cool collection. Clancy picks only the best basketball players for his team, but realizes he misses his favorite teammate; Sheree makes a magical friend in the forest. Julius and the gang avoid visiting a rhinoceros because of his grumpy reputation; Julius makes a promise to Worry Bear that is hard for him to keep. When Ping gets appointed Dazzle's Royal Paper Flower Maker, she has no time for anything else; Julius keeps his friends waiting for a sailing trip. Pirate Diamondbeard and Julius switch places for a day; Julius and the gang all pitch in to help Marcel the Martian get the garden of his dreams. A peek at Worry Bear's sketchbook convinces the gang that he is mad at them; Sheree prepares for her magic show, and the gang's belongings disappear. When Clancy breaks his skateboard at the competition, Julius figures out a way for him to compete; Sheree's pals help her search for her superpower. 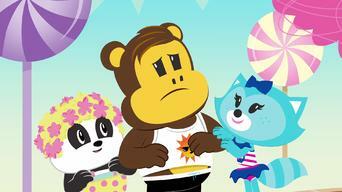 Rock Sock tries to throw the perfect surprise party to show appreciation for Julius; Worry Bear is labeled a hero when he supposedly saves a chick. 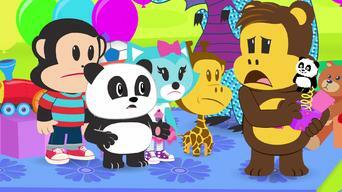 Julius invents a way to turn his friends into versions of himself, then starts to miss their differences; Ping wishes for Worry Bear to stop worrying. Julius learns an important lesson in an alternate world, where nothing comes to life; Clancy and Ping struggle to keep quiet during a rehearsal. Sheree's plan to spy on Bob has a missing piece; When Ping's friends get shrunk in the Shrinkerator, she tries to bring them back to normal size. When the gang gets locked in a closet, they try to have fun until help arrives; Julius and his friends try to make music without electricity.